populating article comments in a community website - a community website looks a lot better when each article has at least several comments. So when an article is created, few comments need to be created right afterwards. Choosing random names is quite easy, of course, but what if your system allows only logged in users to leave comments (which means, comment table row does not have author string value, but author_id integer foreign key)? In such case you have to look up a random user id in the database, which is pretty impossible. Default form values to the rescue! E-shop product attributes - each product has some attributes that measure its quality, just like reliability, aesthetics, performance and so on. As we know, many information in advertisement is pure bull*hit nowadays, e.g. values of product attributes are probably fabricated. Suppose there are many attributes for each product (available inside the form or inside an embedded form, it doesn't matter). Defining each attribute costs time and an E-commerce shop employee will work slower if he needs to input each value separately. Again, default form values comes with assistance! Above feature is really easy to implement and you'll find it really useful when generating some partially random data. Of course, you may also set random values after the form is submitted, when a form field is simply disabled - but then you don't have a posibility to change it during object creation. Symfony and Doctrine book (chapter 6) describes DQL API, but one very important SQL feature is missing: advanced expressions. Particularly, you may often need to use advanced logical expressions in WHERE clause. 'LENGTH(p.link_rewrite) = 0 OR '. 'LENGTH(p.meta_description) = 0 OR '. Anyway, it works. 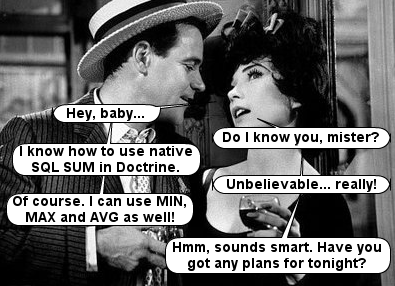 Maybe the Doctrine API will be more friendly in Symfony 2.